Deep Down Tidal excavates the power of water as a conductive interface for communication. From submarine cables to sunken cities, drowned bodies, hidden histories of navigations and sacred signal transmissions, the ocean is home to a complex set of communication networks. As modern information and communication technologies become omnipresent in our industrialized realities, we urgently need to understand the cultural, political and environmental forces that have shaped them. Looking at the infrastructure of submarine fibre optic cables that transfers our digital data, it is striking to realize that the cables are layered onto colonial shipping routes. Once again the bottom of the sea becomes the interface of painful yet celebrated advancements masking the violent deeds of modernity. Deep Down Tidal navigates the ocean as a graveyard for Black knowledge and technologies. From Atlantis, to the ‘Middle passage’, or refuge seekers presently drowning in the Mediterranean, the ocean abyss carries lost histories and broken lineages while simultaneously providing the global infrastructure for our current telecommunications. Could the violence of the Internet lie in its physical architecture? Like countless African and indigenous traditional sciences, research in physics now suggest that water has the ability to memorize and copy information, disseminating it through its streams. What data is our world’s water holding? What messages are we encoding into our waters? Beyond historical sorrow, water is a portal to other realities as its mysterious sea life of mermaids, water deities, and serpent spirits celebrated in many cosmologies remind us. Deep Down Tidal enquires the intricate cosmological, spiritual, political and technological entangled narratives sprung from water as an interface to understand the legacies of colonialism. Tabita Rezaire is infinity incarnated into an agent of healing, who uses art as a mean to unfold the soul. Her cross-dimensional practices envision network sciences - organic, electronic and spiritual - as healing technologies to serve the shift towards heart consciousness. Navigating digital, corporeal and ancestral memory as sites of struggles, she digs into scientific imaginaries to tackle the pervasive matrix of coloniality and the protocols of energetic misalignments that affect the songs of our body-mind-spirits. Inspired by quantum and cosmic mechanics, Tabita’s work is rooted in time-spaces where technology and spirituality intersect as fertile ground to nourish visions of connection and emancipation. 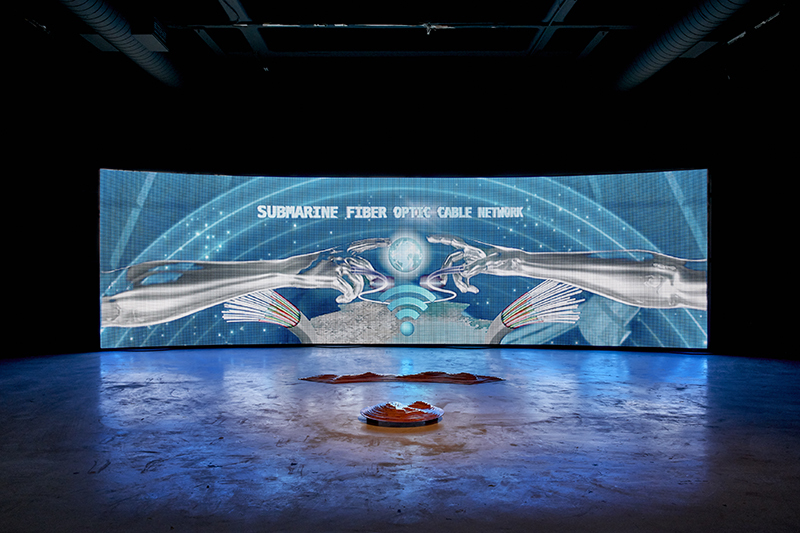 Through screen interfaces and collective offerings, her digital healing and energy streams remind us to see, feel, think, intuit, download, know and trust beyond western authority but towards the soul. Tabita is based in Cayenne, French Guyana. She has a Bachelor in Economics (Fr) and a Master of Research in Artist Moving Image from Central Saint Martins (Uk). Tabita is a founding member of the artist group NTU, half of the duo Malaxa, and the mother of the energy house SENEB.